Letterpress printing is a technique of relief printing using a printing press, a process by which many copies are produced by repeated direct impression of an inked, raised surface against sheets or a continuous roll of paper. A worker composes and locks movable type into the “bed” or “chase” of a press, inks it, and presses paper against it to transfer the ink from the type which creates an impression on the paper. In practice, letterpress also includes other forms of relief printing with printing presses, such as wood engravings, photo-etched zinc “cuts” (plates), and linoleum blocks, which can be used alongside metal type, or wood type, in a single operation, as well as stereotypes and electrotypes of type and blocks. With certain letterpress units it is also possible to join movable type with slugs cast using hot metal typesetting. In theory, anything that is “type high” or .918 inches can be printed using letterpress. Letterpress printing was the normal form of printing text from its invention by Johannes Gutenberg in the mid-15th century until the 19th century and remained in wide use for books and other uses until the second half of the 20th century. 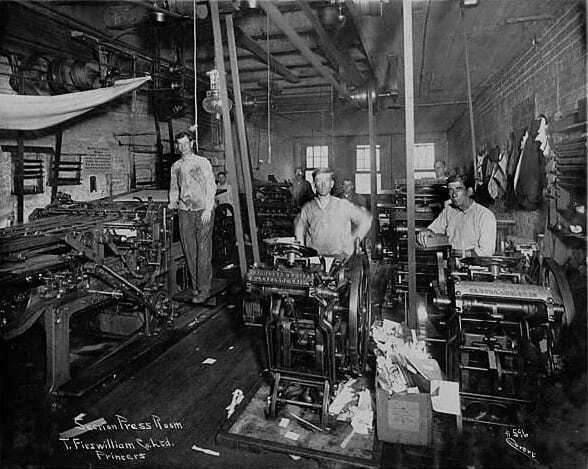 Letterpress printing remained the primary way to print and distribute information until the twentieth century, when offset printing was developed, which largely supplanted its role in printing books and newspapers. All forms of data collection were affected by the invention of letterpress printing, as were many careers such as teachers, preachers, physicians and surgeons and artist-engineers. More recently, letterpress printing has seen a revival in an artisan form. Johannes Gutenberg is credited with the development in the western hemisphere, in about 1440, of modern movable type printing from individually cast, reusable letters set together in a form (frame or chase). Movable type was first invented in China using ceramic type in 1040 AD and the Koreans developed movable metal type in 1100 AD. Gutenberg also invented a wooden printing press, based on the extant wine press, where the type surface was inked with leather covered ink balls and paper laid carefully on top by hand, then slid under a padded surface and pressure applied from above by a large threaded screw. It was Gutenburg’s “screw press” or hand press that was used to print 180 copies of the Bible. At 1,282 pages, it took him and his staff of 20 almost 3 years to complete. 48 copies remain intact today. This form of press work gradually replaced the hand copied manuscripts of scribes and illuminators as the most prevalent form of printing. Printers’ workshops, previously unknown in Europe before the mid-1400’s, were found in every important metropolis by 1500. Later metal presses used a knuckle and lever arrangement instead of the screw, but the principle was the same. Ink rollers made of composition made inking faster and paved the way for further automation.